NEWBURGH – In the midst of an exceptionally long, brutally cold spell this winter, Catholic Charities of Orange, Sullivan, and Ulster was the grateful beneficiary of a coat drive hosted by the Newburgh Rotary Club. The coat drive was the Club’s January community service project. The coats were presented to Catholic Charities at the Newburgh Rotary Club’s weekly meeting which was hosted at St. Luke’s Cornwall Hospital in Newburgh. “Catholic Charities is fortunate to have the generous support of community-minded organizations and individuals, like the Newburgh Rotary Club and its members, who believe in the importance of giving back to the communities in which they live and work,” said Dr. Dean Scher, CEO, Catholic Charities of Orange, Sullivan, and Ulster. “The warm and giving spirit of these donors will make life warmer and more comfortable for the clients served by Catholic Charities who might otherwise go without a coat during this incredibly cold winter,” continued Dr. Scher. The winter coats, and other donated items, are distributed by Catholic Charities’ staff to individuals and families in need throughout the non-profit agency’s three-county service area. Each year, Catholic Charities distributes winter coats, basic household items, gently-used furniture, personal care items, school supplies, and other necessities of daily living. Many of these items are donated or purchased with cash donations. To make a donation, or organize a drive, contact the Catholic Charities Office of Advancement at 845.294.5124, x303 or kristin.jensen@cccsos.org. Catholic Charities of Orange, Sullivan, and Ulster, as one of the human service agencies of Catholic Charities of The Archdiocese of New York, is committed to building a compassionate and just society. Catholic Charities serves the homeless, the hungry, the emotionally and physically handicapped, as well as immigrants, and the marginalized and vulnerable of Orange, Sullivan, and Ulster Counties. Catholic Charities collaborates with parishes, Catholic, and non-Catholic partners alike to help people of all religions who are in need. For more information or to make a donation online, visit www.cccsos.org. Caption: Catholic Charities of Orange, Sullivan, and Ulster was the beneficiary of a winter coat drive hosted by the Newburgh Rotary Club. 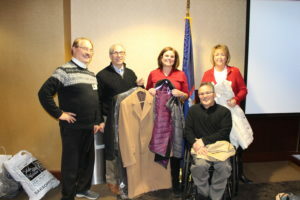 The donation of coats was presented to Catholic Charities CEO Dr. Dean Scher, center left, and Kristin Jensen, Chief Advancement Officer, center right, at a recent Club meeting by members Doug Sturomski, left, Deb Sager, Rotary Club President, right, and Doug Hovey, front.